Photos of your grandparents’ wedding are a reminder of their presence. A wedding is a time of joyous beginnings. The bride and groom are surrounded by family and friends, the people who played a part in helping the couple reach this day. 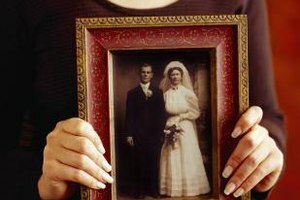 For some couples, however, the wedding is a bittersweet moment when they miss people who have died, including grandparents. Finding a way to honor the memory of the grandparents gives a sense of history to the momentous occasion. There are many ways to incorporate the memory of a grandparent into this special day. Try carrying something that belonged to your grandparent. In some families, specific items are passed down from one bride to another. This may be a veil, necklace or a small family bible. The bride might carry a handkerchief with a grandparent’s initials. The groom might use cuff links, a tie tack or a watch that belonged to the grandparent. Place pictures of the deceased grandparents on tables at the ceremony or reception. If wedding photos of the grandparents are available, try incorporating these into the décor. A photo of the wedding couple posing to emulate the grandparents' photograph can make an attractive pairing in a wedding album. Incorporate something into the wedding that reminds you of the grandparent. Light a candle in the entryway to remind everyone that the light of the grandparent will always shine on the couple. Include a special poem or religious reading in the ceremony. If the grandparent had a favorite song or movie, play the music for the first dance. If the grandparent had a favorite flower, use the flower in the wedding bouquet or reception centerpieces. Consider the grandparents when choosing wedding favors. A special treat that uses grandma’s favorite recipe or a tiny gift from grandpa's hometown work well as wedding favors. There are many ways to take a moment to remember grandparents at a wedding. A simple moment of silence at some point in the ceremony gives everyone a chance to remember those who are gone. At the reception, consider raising a toast in honor of the grandparents, or share a special joke that always got a laugh. Grief is a process. Don’t forget that remembering a lost loved one can be an emotional experience for more than just the bride and groom. Use care when planning a memorial activity. A wedding day should be filled with happiness and joyful memories. What Is the Proper Gift for People Getting Married for the Second Time?